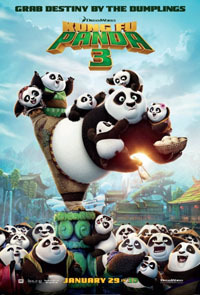 I was not expecting the Kung Fu Panda franchise to become an epic martial arts trilogy, but with Kung Fu Panda 3 the writers looked sequelitis in the eye, and then shot for the moon. Which they hit. This mixes at least two metaphors, but with the Dreamworks crescent moon logo in the blend I think I’m allowed the indulgence. Put another way, they took a big risk, and it paid off. Back in 2011 Kung Fu Panda 2 left me amazed, and more than a little surprised. The craft on display there was exemplary, and in all of the best ways. Kung Fu Panda 3 brought that same level of craft to the screen, and put paid on promises made in the first two movies. I’d say more, but some of the payoff is very much worth not spoiling. Kung Fu Panda 3 clears my Threshold of Awesome, and takes the #1 slot for the year. Not hard, given that as of this writing¹ I've seen exactly two movies, but impressive nonetheless. ¹UPDATE: And now it is July 9th. My 2016 list has 18 films on it, and Kung Fu Panda 3 is still on top. I watched the Kung Fu Panda 3 Blu-Ray² last night, and stand by my rankings. ²As Blu-Rays go, it's fine, provided you're just there for the film. The Panda Party song and Panda Paws featurettes are disappointing. The deleted scenes (Faux Paws) is a nice tool for writers, though, because the directors tell us why these scenes, which were quite good, had to be cut.